We live in a culture of excess, and this culture is a major contributing factor in today’s childhood obesity epidemic. To put it simply, kids eat too much, and this is especially true on Halloween. This Halloween, teach your kids that fun is more important than food. When your children grow up, they won’t cherish the memory of the tenth candy bar they ate after Halloween. You are not doing them any favors by saying “yes” to every plea for more. But that tenth candy bar – or rather, the attitude that it is okay to overindulge – could be the start of a lifelong struggle with weight. And it could lead to serious health problems. The momentary pleasure is not worth the long-term price. 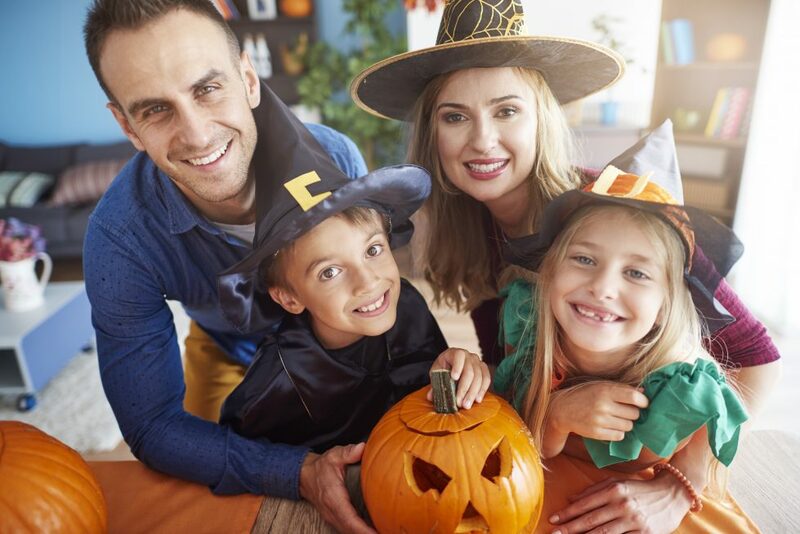 Instead of spending money on a plastic, store-bought costume, encourage your child’s creativity and sense of adventure by making a costume together. You can use materials from around the house or use your costume funds at a local thrift store. Let your child be a part of the planning process. Instead of loading up him and his friends with candy and sweets, play games that get them moving around, and award fun little toys as prizes. Ask your child to search for Halloween game ideas online or at the library. Or make up your own games, like Pin the Tailbone on the Skeleton. Again, the point is to focus on the fun of Halloween, and to stop thinking of it as a holiday to eat enough to make yourself sick. Allow your kids to enjoy a reasonable amount of candy on Halloween, but when Halloween is over, the candy is gone. Use this as an opportunity to teach your children both moderation and empathy in one lesson. Ask your children to help you think of places where they can give away their extra candy. Nursing homes, children’s hospitals, a Boys & Girls Club, even the local police or fire stations. Then take them to the place they chose so they can see how their gift is appreciated. The easiest way to deal with your kids’ pleas and demands is to give in, to say yes. Your kids can’t see the big picture, but you can, and that means that it’s your job to do what’s right, not what’s easy. Be a thoughtful parent. Think about what is best for your kids’ health and wellbeing. Make this Halloween one your child will remember forever, not one that will get lost in a catatonic sugar haze. Make memories, not fat. Your kids will thank you for it some day.